A great way to practice spelling! A great way to teach reading! On this page we offer free bingo cards and printables based on the 1st grade list of Dolch sight words. The download which is in PDF includes 8 different 1st grade bingo cards, and a call-list of the words that appear on the bingo cards. Teachers should print out a the Dolch 1st grade bingo cards and give one to each student. They keep the call-list to themselves, and then play the game of bingo in class, taking the role of bingo caller. Bingo is a great and enjoyable way to help students master the Dolch 1st grade words, and the competitive element can act as a real motivator! Download the ZIP file containing the printable Dolch 1st Grade bingo game, print out the materials, and then play Dolch 1st grade bingo in class: dolch_1st_grade_bingo.zip. Download the free trial version of Bingo Card Printer. This bingo card maker software includes ready-to-use Dolch 1st Grade bingo templates (and hundreds of other templates too). 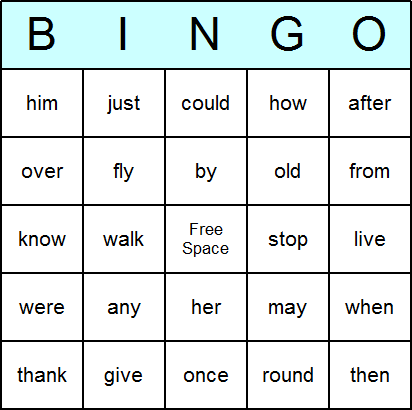 You can use these bingo templates "as is", or customize them by adding colors, adding or deleting items, or printing out larger numbers of bingo cards. Full 220 Sight Word Worksheets Practice to Read and Write: Complete Dolch list for Preschool, Kindergarten, First Graders, Second Grade and Third Grade to learn and remember sight words flashcards. It is effective for learning to read using sight words. If you have a child age 4-8, there is a good chance you will have come across the word ‘Sight Word’.Our worksheets start with learning to recognize individual letters, then most kids are ready to move on to the beginning stages of reading.This sight word practice help building speed and fluency when kids reading. It is important for kids to practice sight words activities because accuracy, speed, and fluency in reading will increase reading comprehension. The sight words are a collection of words that kids should learn to recognize without sounding out the letters. These can be useful sight words flashcards for preschool workbooks and kindergarten, 1st graders,2nd graders and 3rd graders. Flash cards are an excellent way to introduce new skills, reinforce memorization, and support good study habits. This two-sided card set features rounded corners for easy sorting and includes 102 set cards (6" x 3" each) and 1 activity card. Dolch Sight Words Practice - Book 1: Fun and interesting activities to help your student in pre-kindergarten through first grade learn 105 high-frequency pre-primer and primer Dolch sight words. Help your youngster learn to read fluently and confidently with this sight words workbook of fun, engaging Dolch sight word practice activities! Your child will learn to visually recognize 105 of the most common words in order to improve reading speed, accuracy, and comprehension. Your child will build a strong foundation for reading success by practicing individual and multiple-word activities that encourage instant word recognition. The workbook’s animal theme makes learning the Dolch sight word list even more fun! For Pre-k, Kindergarten and 1st grade. 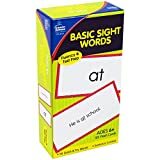 Complete Sight Word List Learning Flash Cards: This high frequency words package includes complete Dolch word lists (220 service words + 95 nouns) ... First Grade, Second Grade and Third Grade. This complete list contains 220 “service words” plus 95 high-frequency nouns. These words comprise 80% of the words you would find in a typical children’s book and 50% of the words found in writing for adults.These site words flashcards aim for children to use them in context when they're reading. Since all of them are the words used most often in reading and writing.Most children will be able to master a few sight words in Pre-K (four years old). You can teach sight words with this effective flashcards. It can be used as sight words games for children who are encouraged to memorize as a whole by sight so that they can automatically recognize these words in print within three seconds without having to use any strategies to decode.Let's have your child spell the word out loud with the sight card, then repeat it; this will allow them to memorize how it is constructed. Garrard Press,, Champaign, IL, U.S.A. The First Reading Books are fun reading books that fill the need for easy-to-read stories for the primary grades. The interest appeal of these true stories will encourage independent reading at the very beginning level.... DOG PALS tells stories about Sammy, Blondie, Mike, Jack, Pal, Paddy, Collie, Rover, Prince, Peter and Kayak, dogs who loved their families. Sight Words For First Graders: Sight word worksheets provide dolch list for kids in kindergarten, 1st grade. It can be used as flash cards or games to teach your child to read in 100 easy lessons. This sight word practice help building speed and fluency when kids reading. It is important for kids to practice sight words activities because accuracy, speed, and fluency in reading will increase reading comprehension. The sight words are a collection of words that kids should learn to recognize without sounding out the letters. So these workbooks have a lot of activities and games for kids to keep practicing such as sight words tracing, reading, coloring, cut and paste. These can be useful sight words flashcards for park, pre k, preschool workbooks, and kindergarten homeschool curriculum. This scholastic book is for beginner readers. In this book your child will dive into enchanting illustrations and follow a little boy named Emery and his sister, Jocelyn through the land to find a Gorgot. This book uses the first 100 Dolch sight words that most public schools districts use in Kindergarten and Pre-K. Most are used multiple times to help your young reader become more confident. This makes learning sight words fun and gives your child the foundations to become a great reader.